Growing up in a large corporate financial services organisation taught our Director, Trevor many valuable lessons. One of these was never to waste time on strategic planning. The organisation seemed to change its strategy with the wind, wasting time and energy every time it changed and demotivating those who had yet another “Strategic Imperative” thrust upon them. Change didn’t stick because it was poorly thought through and poorly executed. He decided that The Employee Engagement People could do a lot better than this. The 5 Steps approach recognises that Leaders need, time, space, knowledge and above all structure if they are to create strategy that sticks. 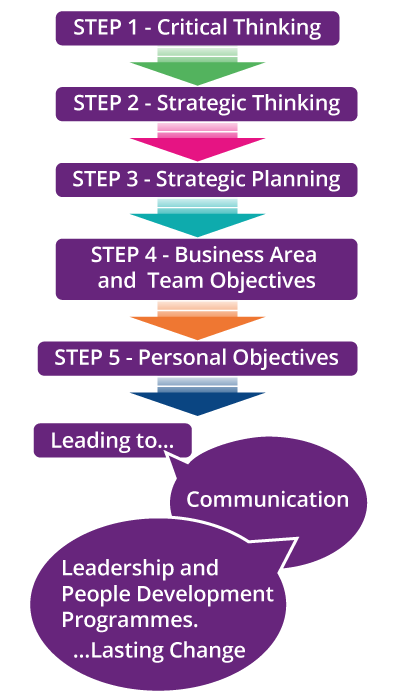 The 5 Steps encourages organisations to bring others beyond the Leadership Team into the planning process…after all, doesn’t that encourage their engagement with the plan?